Wouldn’t it be awesome to have both wings AND a tail? Sure, we would be happy with just one of those, but wings and tails don't really show up together except in mythical creatures. Dragons and pegasi have wings and tails and they seem to have a pretty good time with them, even though their tails just wag around and get in the way. It would be cooler if you had a monkey tail that could actually do stuff, just like the mischievous flying monkey minions of the Wicked Witch of the West. Terrifying, yet awesome, these winged monkeys are ready to swoop in and take out Dorothy and her team of fun-loving friends on their journey to the Emerald City! 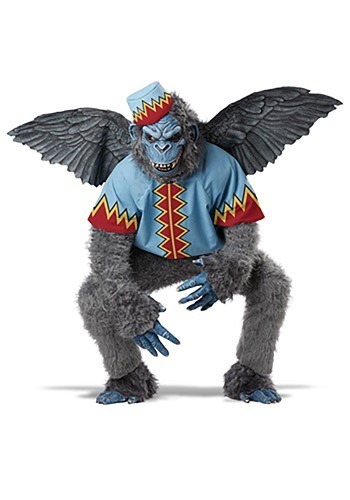 Go ahead and live out all of your wing-flapping, tail-whipping fantasies in this Scary Winged Monkey Costume! This full-body outfit includes everything you'll need for doing all kinds of evil deeds and antics around Oz, with latex wings and a stuffed tail that attach with elastic straps but can come off for convenience if you end up having to drive or take a bus instead of fly to your destination. Furry arm warmers and shoe covers and latex mask will help you look like an appropriately evil monkey. And the printed shirt and hat let you show your allegiance to the Wicked Witch. This costume is great individually or as part of an Oz themed group to scare up some fun on the Yellow Brick Road!